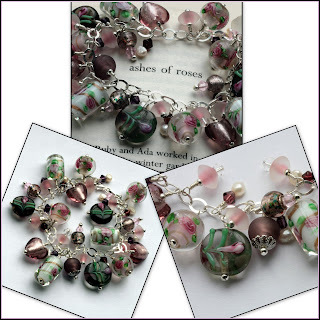 Ashes of Roses, one of my favourite charm bracelets, inspired by Ada Monroe in Charles Frazier's novel 'Cold Mountain', has sold! "The dress the figure wore was the color called ashes of roses . . . Ada realized that it was herself she was admiring, the mirror having caught the reflection of an opposite mirror on the wall behind her. The light of the lamps and the tint of the mirrors had conspired to shift colors, bleaching mauve to rose."